Packaging design trends go hand in hand with any other trend in the sense that they’re always changing. Most people don’t realize that when they’re buying something, they’re sometimes subconsciously buying based off of its packaging rather than what is actually in it. 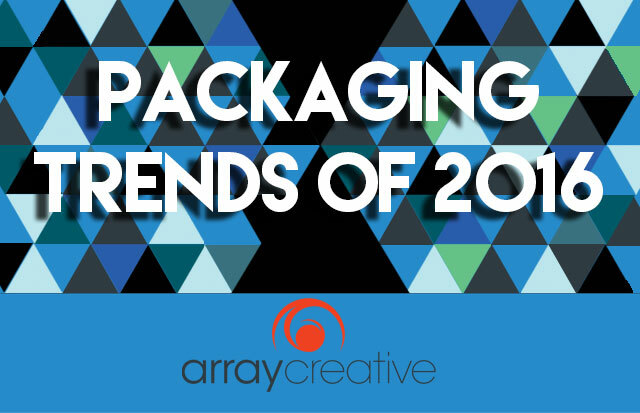 With that being said, it is important for brands to keep their current and potential customers in mind by staying up to date on current trends for packaging design. It’s also necessary to remember that when it comes to packaging, what is on the outside is almost as important as what is in the inside. Listed below are a few of the trends being used in 2016 as told by the Dieline. One of the most popular trends of the year is simplicity. Some of the most successful packaging is clear and to the point. It is important for designers to understand the purpose of the product and their audience’s thought process. This leads to a simple message that is stated clearly and boldly. It gives people the relief of a clear and simple message in today’s chaotic world. Shown below is Quintessentially British’s new tea packaging. The first trend conveys simplicity and honesty through simple fonts and copywriting, but this theme of geometry executes the same idea through shapes and patterns. The most successful packaging consisted of simple patterns and shapes. The colors are also usually limited and monochromatic and/or high-contrast. This package design, like the first trend, eases the consumer’s minds through simplicity and clarity. Simple designs tend to stand out on shelves next to over-the-top and busy designs. The Dieline also states that familiar shapes, colors and patterns communicate an awareness of the world and sensitivity to the consumer. The third trend takes a different direction than the first two in the sense that it focuses on the past. More directly, it focuses in on the ornate, hand-made look. However, these designs are not just remakes of old packaging. In order for them to be successful, designers need to modernize old forms and techniques. The new take on old is seen as refreshing because it takes the best parts of history and renews them. The most successful designs use long forgotten techniques such as calligraphy, letterpress, and foiling. Below is a picture of Bud Light’s newest can design to appeal to the modern beer drinker. One of our past product projects for one of our clients was a logo design for Project Za, a pizza joint. As seen in the picture below, the logo design follows the ‘old-fashioned’ trend. One way the old-fashioned aspect is achieved is through the stamped/screen printed look the logo gives off. The colors used are also very warm, putting an old form twist on the modern sans-serif typeface used. Another one of our past products for one of our clients was a logo and packaging redesign as well as a trade show for GoldToe’s new GoldToe Golf line. As seen in the picture below, the design follows the ‘as simple as possible’ and ‘geometric’ trends. The as simple as possible aspect is achieved through the straight to the point and simple text explaining what the product is and what it specializes in. The geometric aspect is achieved through the light, green, monochromatic triangle pattern in the background of the packaging. When it comes to my personal preference on design, I am more drawn to simple and geometric designs, I always have liked clean, simple, and to the point designs so I definitely am biased and lean more towards trends one and two. I do also believe that it is important to stick to the brand identity so sometimes having an old-fashioned or ornate design is more successful for brands as well. What is your favorite packaging trend(s)? Comment below!